Vintage post cards of Paris (or anywhere, for that matter) are delightful, and are easy and unique souvenirs to bring home. 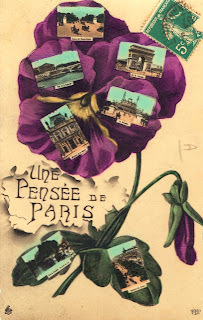 This is a sweet one -- Une pensée de Paris, a play on words since pensée means both pansy and thought. Say it with flowers: Thinking of you from Paris. With the requisite monuments, of course. 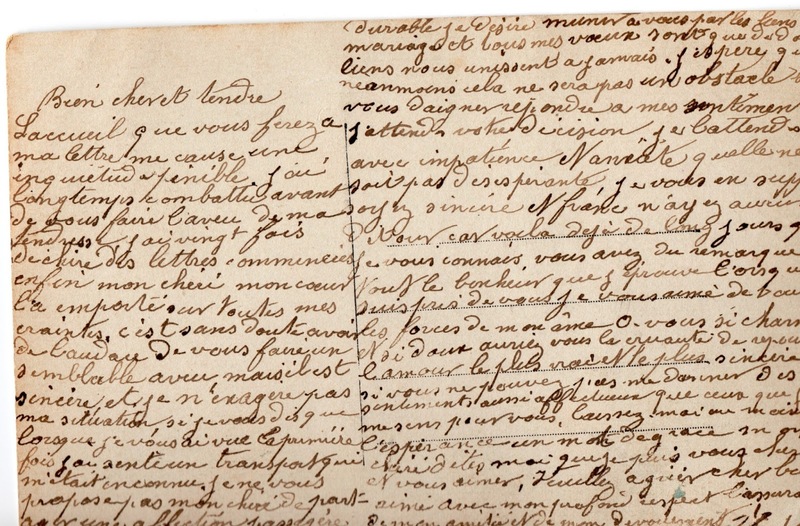 The correspondence on the reverse side of this post card was tame, a perfunctory "Tous mes remerciements, Joanne." 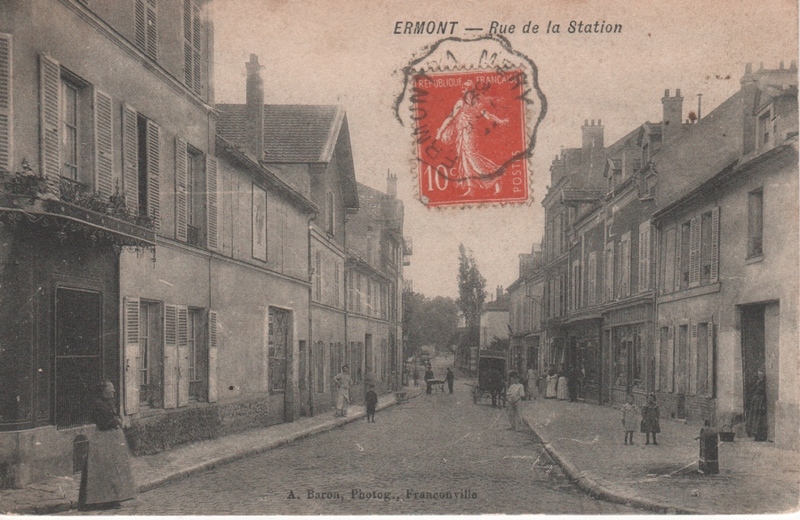 The card was addressed to Monsieur et Madame Giraud, 40 rue de la Station, Ermont, which is just north of Paris. I did a little research: here is rue de la Station at about that time. Probably late 1800s. It's innocent enough, tiptoeing into someone else's thank-you note. 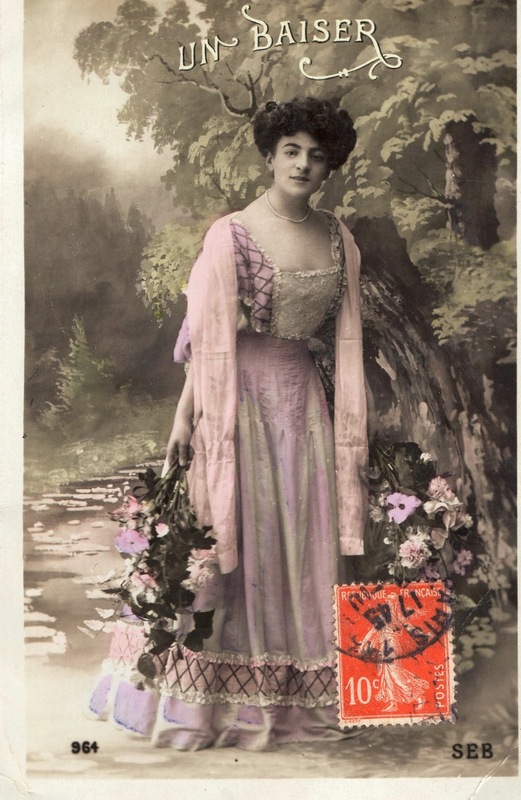 It is another matter entirely to stumble upon an ancient post card containing a woman's bold and feverish declaration of love, which, I fear, may be unrequited. Reading a love letter meant for private eyes feels intrusive ... and yet it causes insatiable curiosity. Un Baiser -- A Kiss. The photo may be the woman herself. (To me it looks like a studio portrait turned into a carte postale.) What do you think? The reverse: no address. I'm not sure how the post card was delivered, because it was stamped and metered on the photo side. It was written probably about 1903. The message? I got so sad reading this. (Translation at the bottom.) The age old story. Thinking about your potential reaction to this letter causes me painful worry. I have been so anguished about expressing my feelings to you. I have begun and then torn up letters to you twenty times, because, dear heart, therein lie my fears. It is certainly bold to make such a pronouncement to you, but it is sincere and I am not exaggerating my current situation if I tell you that when I saw you the first time I felt transported in a way I'd never felt before. I am not asking you to share with me a fleeting affection, which is neither sincere nor long-lasting. I want to be united with you by the bonds of marriage and my only wishes are that we be united forever. I hope that you will return the feelings. I await your decision, I wait for it with impatience and [hope] that it will not be disappointing. I beg of you, be sincere and honest, don't beat around the bush, because I have already known you for so many long days, and surely you must have noticed the joy that I experience when I am near you. I love you with all the force of my soul. O you so charming and so kind, would you be so cruel as to reject a love so sincere and so real? If you cannot love me in the same way that I love you, please give me at least a kind word, dear one please tell me that at least I can love you and cherish you. Please accept dear one with my profound respect the assurance of my friendship and my devotion. Your friend who loves you." 1. What do you think the response was, if any? 2. 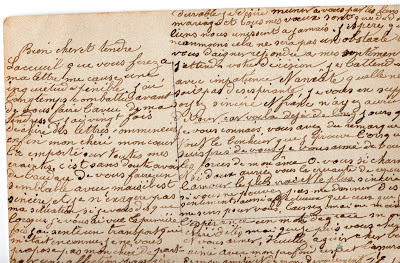 I am amazed that even love letters are closed with "Veuillez agreer....l'assurance de etc etc." That formula is really, really ingrained in the culture! 3. Was 28.16 a code name? Most of this recent visit to Paris, I just wasn't interested in taking photos. It seemed too clicheed, too... I don't know what to call it. Everybody and their brother are taking photos of everything there is to see in Paris. What could I document that wasn't already documented by a hundred thousand instagrams, Facebook photos, and more? So I revisited Paris mostly with my eyes, ears, and heart. I absorbed Paris in my pores. Wow, did it feel good. The summer I was 19 I returned to France to revisit the wonderful friends I had made the previous summer, which had been my first and tremendously pivotal experience in France. That subsequent summer, I borrowed my mother's Zeiss Ikon 36 mm camera and took 6 rolls of film, to document all of the magic that I had lived the year before. Returning home, I had the film processed -- only to discover that the camera's shutter had stuck after the second frame, and I had zero pictures. Zero. On that awful day, I vowed never to live a moment through the lens of a camera... NEVER. I understood that the moment lived is far more important than the documentation of it ... to me. How could I have envisioned 2013, when not a moment goes undocumented and immediately shared with friends? Sometimes I want to just chuck the camera (and everyone else's) and then some times I'm so grateful for those fleeting moments captured by camera. It's a toss-up. That said, I did take a few photos of recurring sights of Paris that I simply had to document for posterity. All from the vicinity of my rental apartment on the Esplanade des Invalides. When you walk out the door and this is what you see every day, you simply have to take a quick snapshot, eventually. Too breathtaking! One thing I always appreciate about ordering an aperitif at a cafe in France: no drinking on an empty stomach! Invariably, one is served a dish of olives or peanuts, or if you're even luckier, some other zakouskis of the chef. Here, lovely standard fare with a glass of Sancerre at le Bar du Central, rue St. Dominique, in the 7e. When the raindrops stop and there is time for meandering around Paris, life just doesn't get any better. On boulevard Beaumarchais, I was heading over to a jewellery vente privee (trunk show) when I saw a store filled with French café chairs. Floor to ceiling, literally. The art, as always in Paris, is to stop in your tracks, head in the door, and check it out. So, of course I went in. Of course I had to find out all about it. I know many people who have longed to have French café-style chairs and tables on a patio, and I agree. Not that I would want to re-create an entire Café de Flore chez moi (though that is possible), but just would enjoy adding a bit of panache, a little je ne sais quoi to a typical outdoor gathering space. Well, Grock France is the place that supplies the furniture and furnishings to the cafés and restaurants of France. The real deal! There were chairs in every imaginable café style, color and chair weave. Plus tables, menu holders, the whole shebang. The genuine article. I hope they deliver worldwide.